A year ago, if you were Jack Massimino, CEO of Corinthian Colleges, you might have been feeling pretty good. Despite extensive evidence from congressional and media investigations that Corinthian, along with other big for-profit colleges, has been abusing students -- luring them with deceptive recruiting, offering high-priced, low quality programs, and often leaving them without jobs and deep in debt -- you seemed to be getting away with it. Almost 90 percent of the revenue for the schools you operated -- Everest, Heald and WyoTech colleges -- was easy money: federal taxpayer dollars from student grants and loans, about a billion dollars a year. You yourself were taking home over $3 million a year in compensation some years. The Obama Administration had tried to tighten up accountability for colleges receiving all that federal money, but lobbying by your company and other for-profit colleges, backed by big campaign contributions to Congress, had put pressure on the Administration, and the "gainful employment" rule that was finally issued in 2011 was absurdly weak. Still, your programs were so bad that a significant number of them were in danger of being shut down by the rule anyway. So your trade association, APSCU, hired one of the most expensive law firms in America, Gibson Dunn, and convinced a federal judge to strike down the rule completely. Life might have seemed good for you. You were somehow charging $47,ooo a year for an associates degree in business at Everest College in Florida, while the same program at nearby Miami Dade Community College cost $6,400. Two-thirds of Corinthian's associate degree students were dropping out, three-quarters of former students couldn't pay down their loans, and 36 percent default within three years, the highest rate of all publicly-traded college businesses. But while your students went broke, Corinthian held expensive annual parties for top staff at locations including George Washington's Mount Vernon plantation and the San Diego Padres baseball stadium, according to a former staffer who attended one of these events and concluded, "Our students are getting poorer, while Corinthian is getting richer." But now things may look very different to Jack Massimino and his top lieutenants at Santa Ana, California, based Corinthian. Although the company tried to put a happy face on it in reporting to investors yesterday, student enrollments are down, revenue is down, the stock price has declined, and the company is laying off staff. One market research company concluded in a report to investors yesterday, "simply put, we believe management is running out of options." And then there is the company's latest "Regulatory Update,"which is quite remarkable. As Corinthian acknowledged, it is now under active investigation by a slew of federal and state law enforcement agencies. 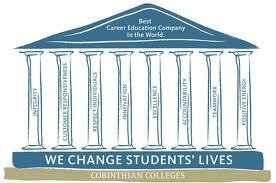 In June 2013, the Securities and Exchange Commission issued a subpoena to Corinthian concerning student recruitment, degree completion, job placement, loan defaults and compliance with U.S. Education Department rules. In September 2013 Corinthian reported that the U.S. Justice Department is investigating claims that the company violated the False Claims Act with respect to its recruiting and financial aid practices and by, among other things, manipulating attendance records to keep federal aid for students no longer in attendance. In October 2013, California's attorney general Kamala Harris, sued Corinthian, charging that the company has engaged in "false and predatory advertising, intentional misrepresentations to students, securities fraud and unlawful use of military seals in advertisements." The suit asserted that Corinthian lied about its graduates' job placement rates, among other things, to prospective students, investors, and accrediting agencies. In December 2013, the Consumer Financial Protection Bureau notified Corinthian that it expected to pursue legal action against the company for violation of federal laws with respect to private students loans. It was disclosed yesterday that in January, even the Department of Education, whose enforcement efforts have generally failed to address for-profit colleges abuses, moved toward taking tough measures with Corinthian, saying in a letter to the company that there were signs of "systematic deficiencies" in its operations. The Department asked Corinthian to promptly hand over documents regarding job placement rates. It also found various Corinthian locations in violation of the federal 90/10 rule, which prohibits colleges from taking more than 90 percent of their revenue from Department of Education dollars. And it denied Corinthian's request to extend federal student aid to some new programs and locations, because the company "has admitted to falsifying placement rates and/or grad and attendance records at various institutions and because of ongoing state and federal investigations into serious allegations." Also in January, Corinthian disclosed that it was under investigation by a group of thirteen state attorneys general (Arkansas, Arizona, Connecticut, Idaho, Iowa, Kentucky, Missouri, Nebraska, North Carolina, Oregon, Tennessee, Washington and Pennsylvania) into its business practices. The state AGs demanded documents and information from the company on student recruitment, costs, placement, accreditation, student loans, and other matters. The new state attorneys general probe has made similar investigative demands to three other big for-profit colleges companies: Career Education Corporation, Education Management Corporation (EDMC), and ITT Technical Institute. Kentucky Attorney General Jack Conway has been leading a bipartisan group of 32 state AGs probing fraud and misconduct in the industry. In December 2013, EDMC agreed to pay $3.3 million in restitution and fines to settle charges with the Colorado attorney general that its Argosy University engaged in deceptive marketing practices. (Argosy led students to believe that the school was working to get its doctorate of education in counseling psychology degrees accredited by the American Psychological Association and that graduates would be eligible to be licensed psychologists in Colorado, but that was not the case.) In yet another case, half a dozen states, along with the U.S. Justice Department, have sued EDMC for fraud, alleging the company paid its recruiters based on the number of students signed up, in violation of federal rules. ITT Tech disclosed in December that, like Corinthian, it is under investigation by the CFPB. The SEC launched a probe of ITT last year. Another of the industry giants, DeVry, disclosed on Tuesday that the Federal Trade Commission, has demanded information from the company regarding its advertising and marketing practices. This the FTC's first big effort to pursue a major for-profit college, but given that the agency's mission is stopping deceptive business practices, there could be more. This is a major development. The Obama Administration is pursuing a new gainful employment rule, and the action on that front has just shifted from the Department of Education to the White House Office of Management and Budget. A strong gainful employment rule remains essential to curbing industry abuses. But these law enforcement efforts may hold greater promise, especially because they may be less susceptible to political pressure from wealthy for-profit colleges and their lobbyists. However, as Stephen Burd recently reported, a previous effort by the California attorney general's office, under then-AG Jerry Brown, to curb abuses by Corinthian resulted in a weak settlement, and political friendships may have played a role. Federal and state law enforcement officials owe it to all the students abused by for-profit colleges, and to taxpayers, to avoid quick, cheap settlements, and demand strong outcomes that prevent big for-profit colleges like Corinthian from continuing their predatory ways.